Some people realize that showing restraint can be truly important under certain circumstances, while others simply struggle to hold themselves back even when they probably should. 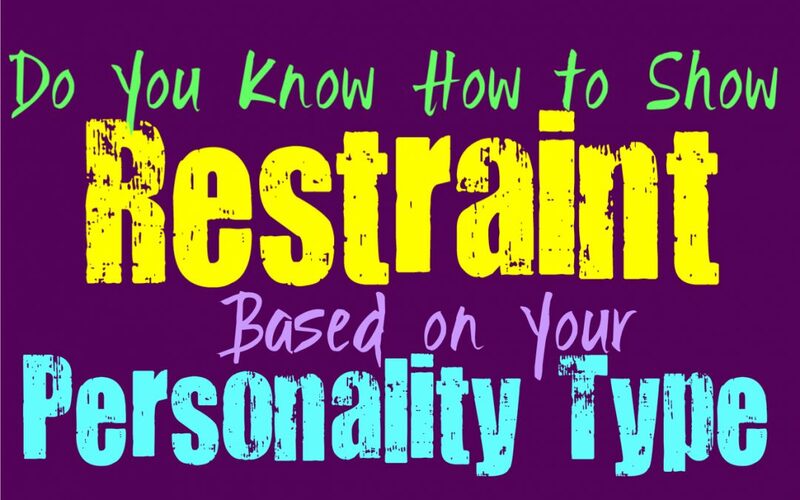 Here is how good you are at showing restraint, based on your personality type. INFJs are often very good at showing restraint, especially in situations where they feel it is necessary. They do their best to hold back, but this often comes more naturally than expressing things openly. INFJs keep a lot of things inside of their own minds and don’t find themselves openly needing to share with everyone around them. They can be somewhat private people and so having to show restraint can often be more natural to them, since they keep things inside of their heads and spend more time inside of their minds than anywhere else. They also can be rather controlled people who realize that sometimes showing restraint is just the smartest choice. ENFJs are certainly capable of showing restraint, especially when they realize it is the most important choice. They are controlled people who realize when they need to take a step back and really restrain themselves and their behavior. ENFJs don’t simply jump into things without thinking it through, since they believe in getting it right the first time around. For the ENFJ showing restraint is sometimes very important, but it entirely depends on the situation. When they become emotionally invested they can sometimes lack restraint, since they express themselves somewhat outwardly and even over the top sometimes. INFPs follow their hearts and seek out the things which feel right for them, and sometimes this leads them down unusual paths. INFPs aren’t always great at showing restraint, even in situations where it can get them into trouble. When they truly feel like they need to express themselves or speak up, it just doesn’t feel right for the INFP to hold back. They are sincere and true to themselves and this is what is most important to them. Because of their desire to follow their own hearts, they just don’t like feeling forced to retrain themselves. ENFPs don’t often have much restraint, even in situations where it might be more important for them. They simply follow their hearts and can sometimes find themselves jumping into things without really preparing for it. While ENFPs know how to get themselves out of trouble when they need to, they still aren’t the best at maintaining a sense of restraint. Holding back often feels insincere for the ENFP, and just doesn’t fit into who they are as people. They have big hearts, ones which they follow openly and they don’t like allowing anything to hold them back. INTJs are great at showing restraint when they believe they need to. INTJs know how to be in control of their emotions and their actions, which is the main reason why they are capable of retraining themselves. For them it simply depends on the situation they are in, and if showing a sense of restraint is the smartest choice for them. If they feel like showing restraint would simply be done for the sake of someone else, they won’t feel like they need to hold themselves back. INTJs will follow whichever option is the most logical and reasonable choice for them. ENTJs are definitely good at showing restraint when it is important to them and the situation. They are very controlled people who do their best to approach their choices with a sense of logic and preparedness. For the ENTJ showing restraint really isn’t a challenge for them when the situation calls for such a response. They are focused on getting things done and believe in doing things in an efficient and intelligent manner. While they often show restraint this is only when it is the most logical and practical choice, in situations where standing out and expressing themselves is needed the ENTJ won’t be afraid to do this. INTPs don’t often struggle with restraint simply because they are such internalized people. They keep things to themselves most of the time and don’t feel like they need to share everything they think or feel. For the INTP restraint is usually something that comes naturally and more comfortable than being someone who openly expresses themselves and acts outwardly about things. While in most situations they can be restrained, it does depend on the circumstance since INTPs are curious people who sometimes like stepping outside of their comfort zone when people least expect it. ENTPs aren’t the most restrained people, simply because they don’t like feeling controlled in this way. They believe in experiencing new things and going after whatever feels right for them and whatever will gain the most reward. ENTPs want to feel free to reach out and really dive into something, without having others trying to hold them back. Sometimes ENTPs can be a bit rebellious and will lack restraint simply because someone is trying to make them feel controlled or trapped. ISTJs are often very restrained people who possess quite a bit of self-control in their lives. They believe in going after what they want without allowing people to hold them back. For the ISTJs restraint is an important part of showing that they can control themselves and are reasonable people. They follow what is practical and right in their minds, without allowing others to dictate their behavior. ISTJs can often show a great deal of restraint even when they are frustrated, since they don’t want their emotions to control their behaviors. ESTJs are often rather good at showing a sense of restraint, especially where it count most. They are goal-oriented people who work very hard to go after what they want in life. They value efficiency and believe in doing things right the first time around, rather than allowing themselves to dive in without being prepared. ESTJs are hard-working people who believe in maintaining a sense of control in their own lives. For them this means showing restraint when they need to, and now allowing their emotions to control them. ISFJs are often very controlled people who know how to show restraint when it matters most. They believe it is important to maintain a certain image in some ways, and it just isn’t appropriate to allow themselves to be too expressive outwardly. ISFJs do believe in controlling themselves so that they don’t upset others or push the limits of what is appropriate. ISFJs are often very capable of restrain in most situations, especially where it matters the most. ESFJs are often capable of restraint, especially where it is most important. They work hard to control themselves and don’t like doing anything which might upset those around them. For the ESFJ it is often very important to show restraint around others and to show that they have a sense of control in their own lives and behaviors. Where ESFJs might struggle with restraint is when their loved ones are involved and they feel like they need to defend someone who is important to them. While ISTPs are logical people who believe in analyzing information, they do sometimes lack a sense of restraint. They can appear more restrained simply because they internalize a lot and often enjoy spending plenty of time by themselves. While they might be loners in some ways, when the ISTP is around other people their lack of restraint can often be seen. They go after what excites them and sometimes this means jumping into a situation without holding themselves back at all. While ESTPs possess many strengths and skills, showing restraint really is not one of them. They follow their desires and passions and go after what inspires them in the moment. ESTPs often struggle to show restraint with their emotions and especially when they are excited or worked up about something. They don’t like feeling like someone else is trying to control them, and so sometimes they even struggle control themselves. ISFPs follow their hearts in life and sometimes this means lacking a sense of restraint. They aren’t always good at holding back when there is something they want, instead they just follow what feels right. ISFPs are very focused on the present moment and sometimes this means they fall to look at what might occur down the line. They just don’t believe that restraint is vital, instead they do the things which inspire them and ignite their passions. Restraint really isn’t one of the greatest strengths of the ESFP, since they follow their emotions in the moment. They don’t always have much self-control, since they allow themselves to after the things they want without really holding back. For the ESFP it is best to follow their passions and their heart, without allowing anything to control them in the moment. This can cause the ESFP to lack restraint even when they probably should hold back a bit, but this simply isn’t who they are as people.